On the third Monday of every January, we remember and celebrate one of America’s greatest civil rights warrior Martin Luther King, Jr. Today I reflect back on a handwritten note my Uncle gave me not too long ago. It was written by my Dad in about 1955-1962 when he was a young man from tiny Alta Loma, TX and headed off to the University of Texas Austin. I never knew this note existed until my Uncle — a close dear brother-in-law to my father — brought it to me and shared its context. It meant a lot to my Uncle because my father meant a lot to him. Uncle Dale and my Dad had enormous mutual respect and fondness for each other. They saw eye-to-eye on many social and political issues of the day. It feels right to share the note here today. 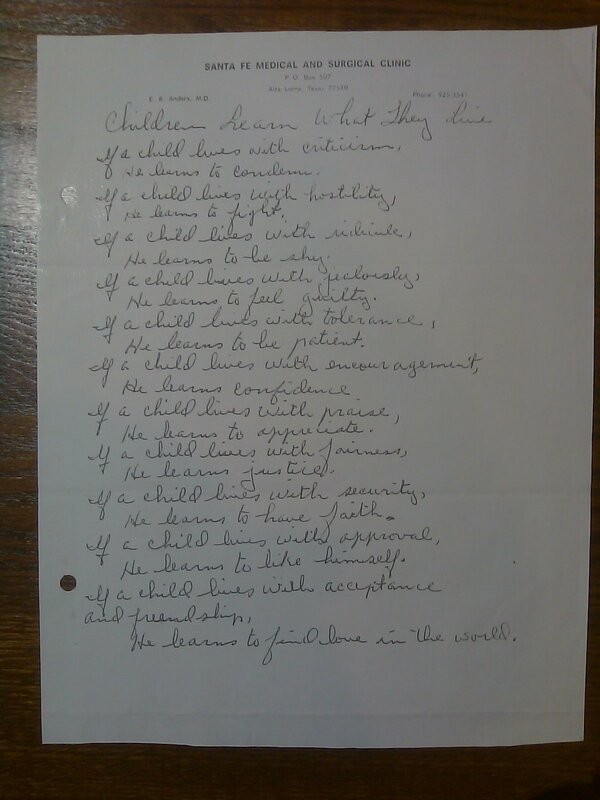 It is entitled “Children Learn What They Live” by Dorothy Law Nolte, a popular American writer and family counselor of my Dad’s era. A picture of the note is above. I remember throughout my childhood all the way up through my senior year of high school, Dad would often tell me that people are not born to hate, not born to kill, and not born to discriminate unless they are taught to do it and surrounded by it. That was not, he would adamantly explain, the definition of true freedom, true liberty, true equality in which our nation was supposedly founded! Furthermore, those three principles do not fully exist if it is not safe for someone here to be unpopular, like Martin Luther King, Jr. in the 60’s. If only one person in society is scared for their life or safety, for merely being different or thinking different, then the whole society IS NOT a free one. It is something less or worse. It is amazing, probably appalling, that since 1775 and the words of our Declaration of Independence that “all men are created equal“, since 1863 and again the same words from our Emancipation Proclamation, since the hundred years of Jim Crow Laws from 1866 to 1965 which after 1776 should have never existed, since the 1900’s and Women’s Suffrage, and then still today in the 21st century, the United States is STILL dealing with forms of inequality and civil rights violations. A foreigner looking in to our shores — with our Statue of Liberty in the foreground — would quite rightly scream, HOW IS THAT POSSIBLE!? To that foreigner I would respond ashamed repeating what my father taught me… “because it is still being taught.” Hate, violence, killing, discrimination, prejudice, bigotry, elitism, and divisiveness are all taught. It starts with the parents and family, then the immediate community, and if unchecked, continues through following generations. It is there at the roots and in those hearts that it must be untaught and the cycle broken. Happy MLK Day everyone! And please remember the cost and continuing responsibility required to protect our fragile freedom, liberty, and equality for not just a few, or those in distant lands, but for ALL Americans right here within our own national borders! We’ve progressed a bit in 240 years, but we still have a ways to go! This entry was posted in Civil Rights - Wellness - Politics, History - Religion - Education, Social Lifestyles and tagged American history, Bigotry, Children, Civil Rights, Dorothy Law Nolte, Family values, Martin Luther King Jr, Parenting, Prejudice, Racism, Role models, Teaching by Professor Taboo. Bookmark the permalink. Yes, I had been deliberating how to blog about it because of its personal and social meanings. Today seemed quite appropriate, finally!